The best part of being on social media as a blogger is getting connected with like-minded people in my industry. Beauty plays a big part in our lifestyle, and we try to use healthier alternatives to the beauty products we use. We have discovered many Natural Beauty Brands based in Brooklyn, all of which have unique brand identities and amazing products that have inspired us in many different ways (see our stories with Palermo Body, Plant Apothecary, and Soapwalla). 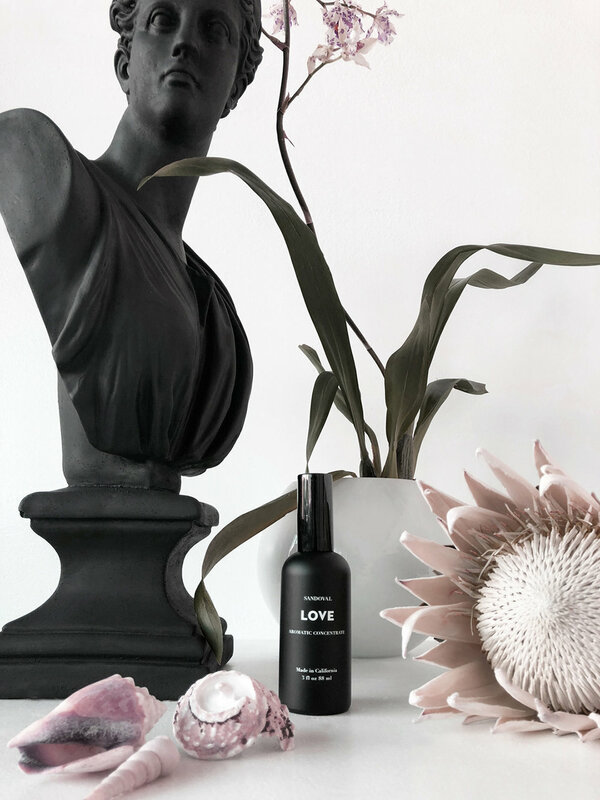 And, our journey to discover natural beauty brands continued on the West Coast with San Francisco-based beauty brand Monastery and interview with its Founder, Athena Hewett, in our previous story (see Athena’s Interview here). How did you get started with Sandoval? Michael: I worked in Fashion in New York, and moved to San Francisco to teach Fashion Education in SF Academy of Art. While living in SF, I discovered SF Rainbow Market (Co-op market of organic grocery) and was impressed by their Natural Beauty Department there. I started to buy there and began to experiment in making my own things to share, at first, with myself and friends. I, then, moved to LA, which is where I am based now, to start all over again in my mid-30s but work as if I were 25 years old again. I knew I wanted to get into Home and Space, so I started collecting mid-century goods and vintage furnitures with the help of my friends working in prop-styling . After working in Home, I realized that selling vintage goods was quite limited. After some time, I caught inspiration to create something new - something that smells good, looks good, and not something merely visually beautiful, but something with a beautiful experience. I researched oil houses in Marin County CA, organized information into things that I like — practical and nice smelling, yet not synthetic and potentially damaging. I started off with these four scents: Peace, Love, Captain, and Wood, and revealed them at a craft show. This served as a rehearsal for pop ups and trade shows to estimate how much I could potentially sell. Within two days of the craft show, I sold $2500 worth of what is now Sandoval products. This marked the beginning of my new journey in bringing Sandoval where it is now. What is the meaning behind the name Sandoval? Michael: San-do-val. It was my grandfather’s middle name, also my great grandmother’s maiden name. This word has helped me spiritually find my ancestral root. What inspires you the most when you create a new scent? Michael: I get inspired when I’m in nature and smelling things around me. I’m really into nature! Even when driving around LA, I notice there’s always something blooming, like Orange Blossom and Jasmine, which were the inspirations to create the scent, LOVE. I don’t do much research on other brands to avoid being too commercial. I feel like everything right now is a version of something else. My products are based on my experiences, and I find inspiration by discovering things naturally in this man-made world. Can you share some of your rituals when using your products? Michael: Twice a month, full and new moon, I charge up collected crystals at home. I clear them with Sage and bath them with water, thinking about the things I want to manifest, love that I want to send out there, and love that needs to get loved. Can you tell us the story behind the charged crystals contained within your products? How does it work with the scents you created? Michael: I got into crystals when I moved to California. It helps to give me a place to focus my energy. When the crystals take energy from moonlight, it refines and transfers the energy to us. It becomes representations of what is in me. When I create products, I shake oils with the crystals inside the bottle so that the energy from the crystals mix the ingredients well. What is your favorite product/scent you created, and why? Michael: “Wood” candle. It really smells like you’re outside in the most authentic way. In nature, wood smells pure. The scent of Northern California’s marshy green and wet forest inspired me to create this. Wood helps me feel like I am outside. What is “The Scent” you have at your home right now? Michael: Currently I’m using four products at home. I spray Peace and Spirit, and I burn Sacred and Clear. Well, there’s Alchemy Candle in the other room as well. I use multiple scents because they do not over-power nor over-compliment one another. We (Bobo and Bibi) use candles at home, but we’re not very familiar with Incense or Aromatic Sprays. Can you tell us the different benefits between using Candles, Incense, and Aromatic Sprays? Michael: Good thing about sprays are that they will not smell like heavy perfume, and will fade quickly, but when you leave and come back, you will still smell it. You can directly spray in on your textiles, bed, sheets, throws, bathmat – killing the stinkiness, germs, bacteria. Sprays are also useful on scarves, beanies, winter boots, and cashmeres, all of which are the things you don’t really wash often. It kills odor-causing bacteria and leaves it with a nice scent. As for Incense, it is a practical luxury used to refresh your surroundings. Had so much fun talking to Michael about his passion towards his brand, Sandoval and how it became to be. Thank you Michael for your time to share your story.